Horse gram is a less popular bean from the family Fabaceae. This is called as Kollu in Tamil and Kulthi in Hindi. Horse gram is said to have medicinal value and they are rich in Iron and molybdenum. I prepared this delicious and healthy kollu idly for yesterday's breakfast and we enjoyed it with garlic chutney. 1. Soak horse gram over night. 2. Soak Idly rice for 3 hours. 3. Grind them both separately. 4. Combine ground rice and horsegram, add salt. 5. Mix well and ferment for atleast 8 hours. 6. Serve hot with any Chutney. healthy n power packed idli.. interesting n tempting ! puthusaa irukkunga intha recipe! healthy and nice! Hey its a nice and healthy idli's. Nithu Thanks for visiting my blog and dropping your lovely comment. I am conducting 2 events in my blog and would like to invite you to post your lovely recipes and make it a successful one. Idlys look wonderful and tasty.Nice click too. Wow! That's very healthy and nurtitious idli. lovely.i have a pack of horse gram unopened.will give it a try. this looks yum..quite different and very healthy.. Healthy idli..Horse gram adda a lot of nutrition to it..nice recipe Nithu..
Wow..we make chutney with horse gram, this is interesting Nithu..will def try this..
Nice idea! Good for health! 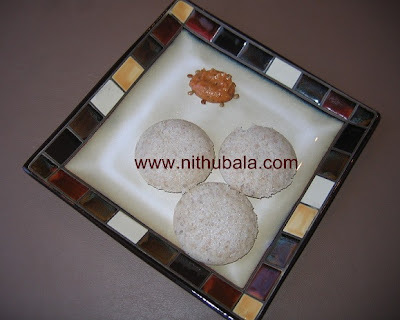 Woww nithu, super nutritious idli,looks soo soft dear..
wow...thanks for sharing this wonderful recipe. Hope you got my reply mail regarding guest post. Could u mail me d details.